If you enjoy floating toy boats in streams and creeks, you might think you need to buy a commercially produced boat from a toy store. However, you can make a toy boat using even the most basic materials that can be found in your kitchen pantry, such as aluminum foil. 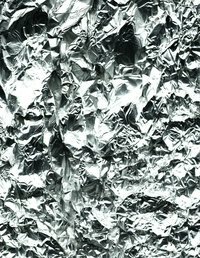 To make an aluminum foil boat water-worthy, it is important to construct the foil in a way that will make it sturdy enough to hold small objects, such as pennies. Cut a sheet of aluminum foil into a rectangle using scissors to measure 8 inches long by 6 inches wide. Place the rectangle vertically in front of you on a flat surface. Fold the top two corners over by 3 inches, touching the top edges together. Press the folds flat with your hand. Fold the bottom two corners up by 3 inches, touching the bottom edges together. Press the folds flat with your hand. Apply waterproof tacky glue onto the surface of the top folded ends, then press them together. Repeat to glue together the bottom folds. Allow the glue to dry for 30 minutes. This will create a boat form from the aluminum foil. Press your fingers into the boat form, and flatten the bottom of the boat into a rectangular form. This will stabilize the boat, enabling it to hold objects while staying afloat in the water.